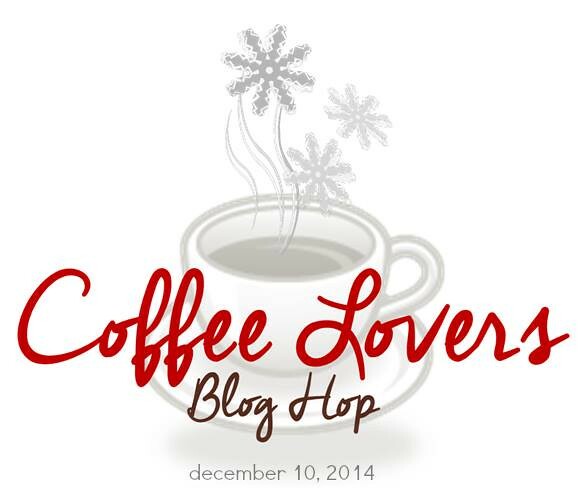 Welcome to the Holiday Coffee Lovers Blog hop! This blog hop is organised by Amy Tsuruta and team. Being a coffee lover, I decide to participate in the hop especially for the holiday season. First, here is my card for the hop. There are some fantastic prizes from these lovely sponsors. Check out Amy’s blog for more details. Gayatri! 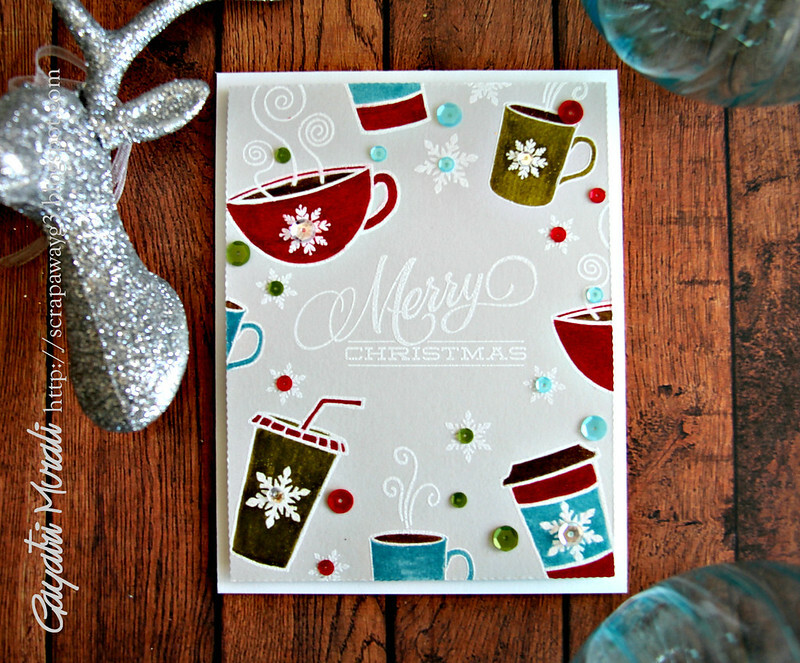 It's an adorable card…love all the stamping/embossing & colors!!! Oh, my! This is AMAZING! Love it! Awesome card, looks so beautiful!!! Super fun mixture of cups! Fantastic stamping! Love this so much! Super cute card Gayatri. Love the white heat embossed images and the coloring. Gayatri, this is awesome! Love the white embossing & the coloring. Awesome card as Always love the white embossing. What a fun collection of coffee cups! Wonderful card! i REALLY love this card! same colors as my living room! 🙂 awesome stamps! Your card looks like my cup cupboard…cups from everywhere…but I love them just like I love your card! Oh, this is so pretty & fun! I love it! WOW! This is so pretty, Gayatri! I LOVE it! Great card! I love how the distress markers turned out on the fog card stock. Thanks for sharing your process! I really love this, Gayatri! Awesome way to use up all the cups 🙂 Gorgeous colors! And love your blog title. Wow! The colors on this card are just divine! Great job getting all those images on one card without making it look too crowded. Stellar design. let me say this. I LOVE the way these look colored. I just had to find out how you did it! Distress markers. Brilliant! They look fantastic against the white heat embossed lines! I LOVE the collage of coffee cups. Very smart! Very festive and cheerful! Love it. Very cute card. Love all the colorful sequins. LOVE Your coffee card!!!! CUTE!!!! LOVIN all the color here!!! Love your playful design and pretty colors! This is fabulous Gayatri! 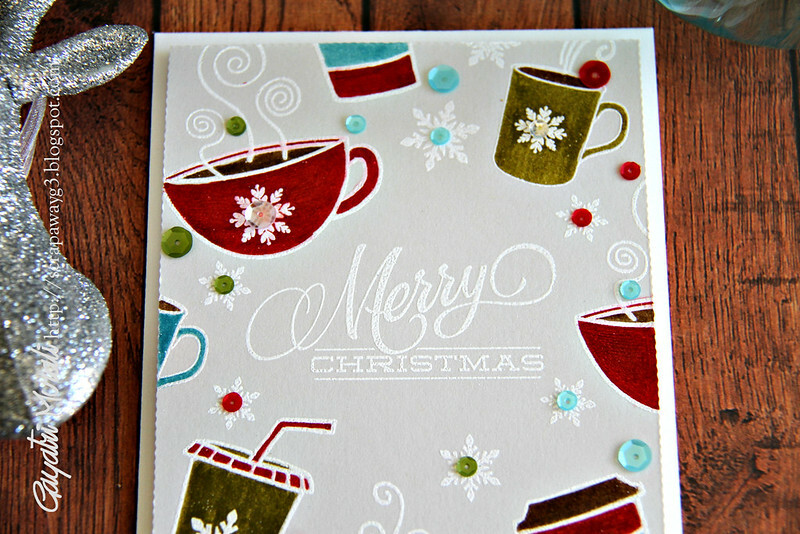 Hi Gayatri, I came to commit on your tag then say this gorgeous , coffee card! Love it! Just so pretty to look at! What cool card and great way to combine stamps. Those holidays cups are so much fun! Adorable Christmas card! I LOVE this card! It's so bright and colorful! Fabulous card…love the images and sequins! So far? This one is my favorite. Love the way you surrounded the sentiment with all the cups. Great card. How fun to just go ahead and use all of your coffee images! 🙂 Love it! I love this! What a great way to use your stamps! AMAZING!!!! Love the white line technique and the rich colors you used!! Stunning. Oh my gosh!!! Super creative designing your paper with stamps!!! Love your card!!!! What a fabulous card! I love the distress ink coloring on the mugs and those awesome sequins you used to add to the snowflakes! Love your collection of coffee mugs! Beautiful and fun card! My eyes cant believe what they see…..amazing!!! This is really beautiful! I love the white embossing and the sequins. I'm so going to CASe this–fab card! I just love how you made the images “dance” around the sentiment. 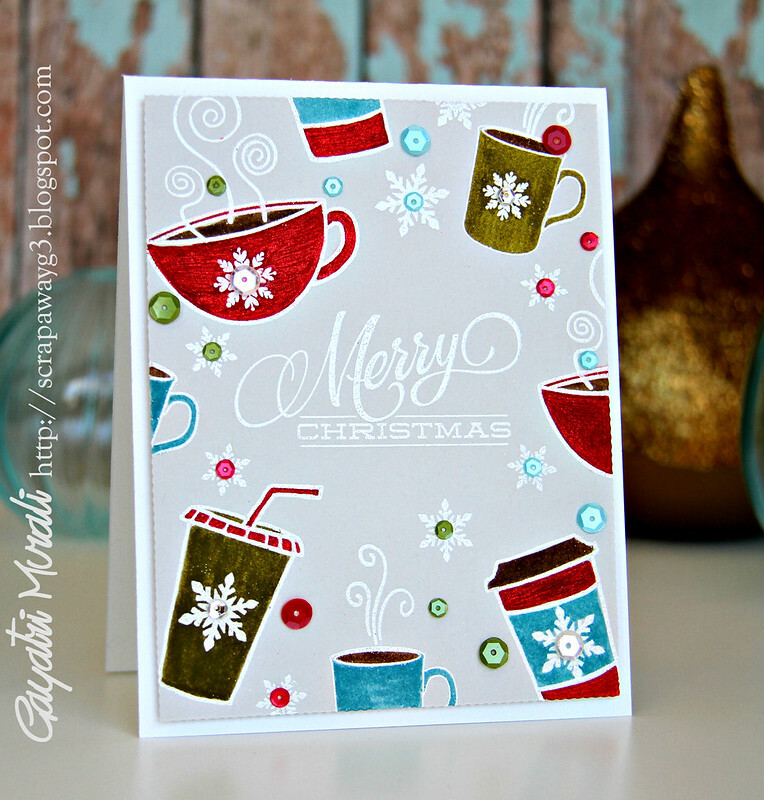 Beautiful card, Gayatri, love all your coffee cups and the white embossing is fabulous! Happy Holidays! Wow….love this card! The colors and design are fabulous! Fabulous design; how fun to mix all those stamps into one amazing card. So awesome! Love how you mixed all of your stamps to make one awesome card!!! I love your bright and festive card! I seriously thought this was DP – it's a perfect card and love the coloring of the scattered cups. beautifully done! love your colors! Love the coffee cups with snowflakes and all those sweet sequins!! Wow. You're card is amazing! Love how you did it. Great idea to using all the cups from different sets. great design! Great coffee cups and Love how you colored them after the embossing. love this card! Festive, happy, great card!! Thanks for sharing!! New follower here!! Newest follower here, LOVE your card, gorgeous layout and colors.. the white embossing is perfect! ok – amazing! i LOOOOOOVE that distress marker coloring!! and the colors you chose too – INCREDIBLE!! the white heat embossing – swoon! it's just perfect!! super lovely and festive card!! Wow! So pretty! Love the bold colors here…. Great design! I love your style! Whats brilliant about this is how you mixed so many different colors (ink and sequins) and it still looks so clean!